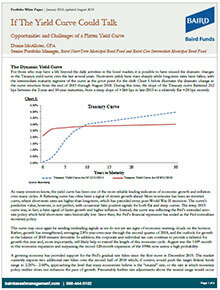 The rise in short-term rates has created attractive valuations on the front end of the investment-grade curve. If the curve could speak, almost certainly the shorter maturities would now be shouting, “Look at me... Look at me!” Not since late 2008 have investors been able to earn 2.0% or more on high-quality, short-term bonds. In our latest white paper, Senior Portfolio Manager Duane McAllister explains how the recent boost in short-term yields not only allows investors to once again earn a reasonable nominal return on their money without needing to take significant duration risk, it also provides an opportunity to earn a positive real return, since core inflation measures remain below the Fed’s 2.0% target. The experienced professionals at Baird Funds have decades of experience helping fixed income investors navigate changing markets like those we are experiencing today. We strive to manage risks for our investors while providing shareholders with consistent, incremental returns relative to industry benchmarks across market cycles. Review Baird Bond Fund performance. Performance data represents past performance and does not guarantee future results. The investment return and principal value of the investment will fluctuate so that shares, when redeemed, may be worth more or less than their original cost.- Current performance data may be lower or higher than the data quoted. For performance data to the most recent month end, contact Baird directly at 866-444-9012 or www.bairdassetmanagement.com/baird-funds. To read the fund's prospectus or to obtain the fund's performance to the most recent quarter, SEC 30-day yield information, any sales charges, maximum sales charges, loads, fees, total annual operating expense ratio, gross of any fee waivers or expense reimbursements as stated in the feed table, please visit the firms webpage here. Warren Pierson, Baird Advisors Deputy Chief Investment Officer, discusses implications of the flattening yield curve.